Sphatik Shree Yantra is a handcrafted pyramid that catches radiant white light energy and reflects back rainbows. 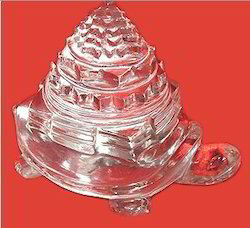 The power of the Sphatik Shri Yantra lies in the pointed apex of the pyramid that represents the doubled powers of Trinity. The more pointed the apex, the stronger are its powers of healing. Shree Yantra helps in breaking down obstacles and negativities. Our firm, Raj Arts was founded in the year 2004 as the eminent name responsible for manufacturing, supplying and exporting Painting & Gemstone Products. Crafted at our high-end designing unit, the proposed range is brought in with significant designs & perfect finish. We take out the complete process as per the industry laid parameters, executing the creative ideas of our in-house craft person. Under the extensive array of products, we have introduced Spiritual Healing Crystals, Religious Statues and Tibetian Carving Items, so that our privileged clients must have ambient solutions for their home décor as well as commercial needs. We carry out the complete designing procedure at our workplace using a sophisticated range of machinery & tools. During the procedure, our in-house creative designers, responsible for creating the preferred scope of art pieces, back us for the exceptional work to be performed. As committed towards meeting our customers’ expectations and to offer them products as per their desired standard of quality, we follow & maintain stringent quality protocols. From sourcing of raw materials till the final deliverance, we pay strict approach and thus, assure our customers to have unique items offered under our basket of art pieces. Working with a belief to establish our customers satisfied, we pay utmost consideration for the entire procedure and, thereby, ensure them to have excellent solutions from our end. Owing credit to these attributes, we are exporting our products all over the world and have become a reckoned name in the industry.